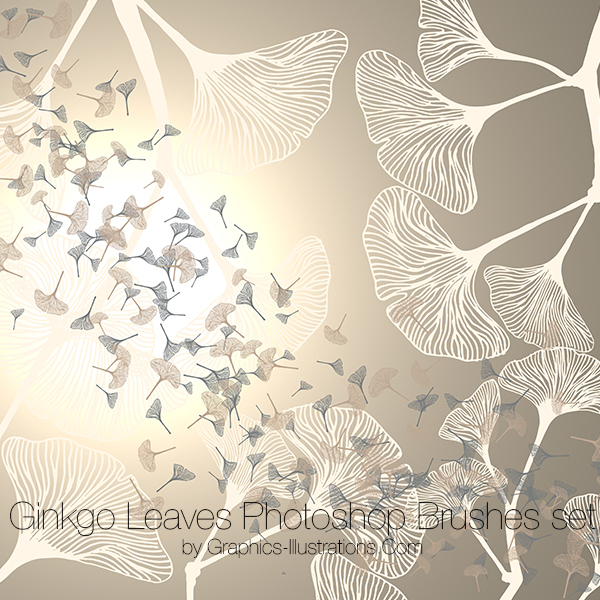 It has been a while since I was that happy with something I made as I am now with this Ginkgo Leaves Photoshop brushes set. So, obviously, since it was a long time since I wrote a blog post, this brand new set inspired me to make one and announce it. Nature has always been and I guess always will be an inspiration to artists. But not just artists. Innovators, constructors, scientists … well, now that I think of it, I tend to believe that, one way or another, the nature has always been a source of inspiration to all of us. No matter what we do. Shapes of nature come in such great variety and in such a beautiful forms that artists can spend a lifetime learning from them and still never come even close to exhausting this infinite source of beauty. And I am no different. Last week, when I looked at this ginkgo tree in the park I got overwhelmed. It was so elegant and beautiful. This tree offered a lot and all I had to do is to choose one of the infinite variations of it’s form and put them on paper. I saw these in particular way and my impression of it just had to get out. On paper. So, this first thing I did when I came back home is to grab a pen and a piece of paper and get my impression out. 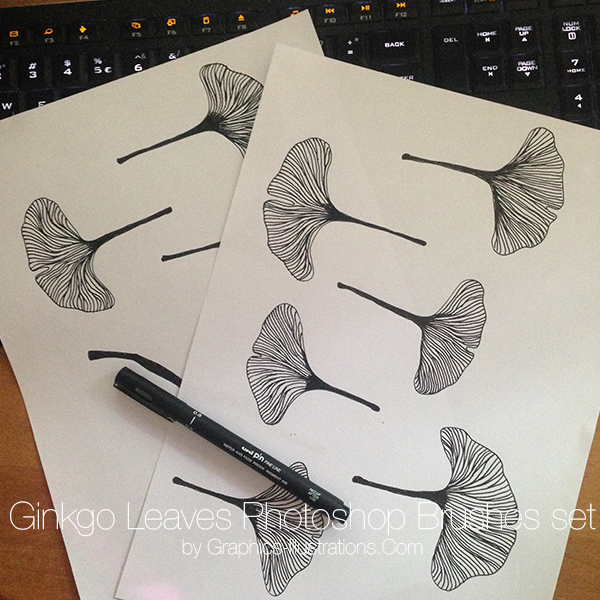 And, yada-yada-yada, after a little bit of scanning, converting and fine-tuning them in Photoshop the Ginkgo Leaves Photoshop Brushes set was finished. Hmm, now that I write this way it seems like it was in no time, but it wasn’t. If you ever created Photoshop brushes starting with your own drawing you will know that this is actually time consuming project. I guess these vector files are at least as valuable as Photoshop brushes as these remove any limits when it comes to the size of your project. 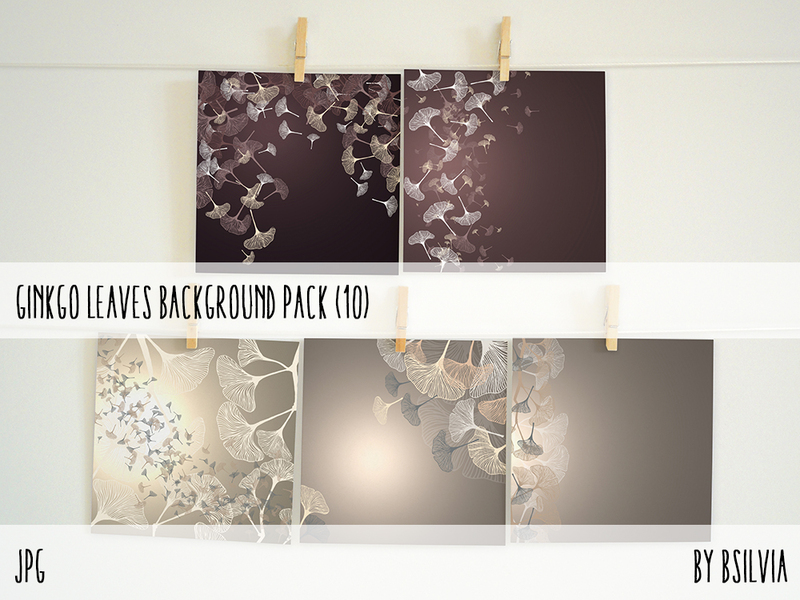 As some of you already know, I now have a shop on Etsy as well and, for starters, I made some backgrounds with these brushes for it. 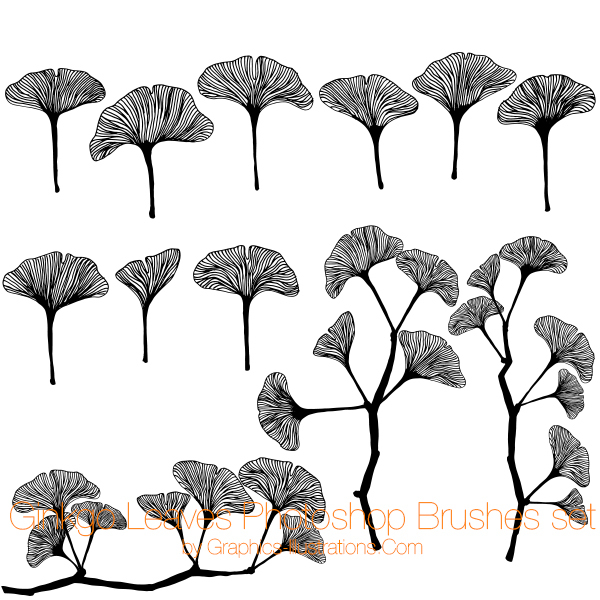 Somehow, I feel that this set will be used in many different design projects. These backgrounds are just a “whisper” of a great singer and in the future I know they will “sing” on numerous design projects. Whether it comes to scrap-books, graphic design, packaging, web design …I truly hope you will see these as a beautiful add-on to your projects no matter what form of visual expression they come in. Anyways, until next time, stay well, spread love and have fun creating!